We love a surprise wedding! Audrey and Jerry traveled from Baton Rouge with their two sons. The boys thought that they were just having a weekend away, but Mom and Dad surprised them with a trip to Walt Disney World, in Orlando, Florida. 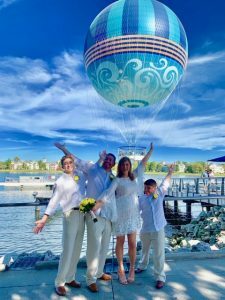 If that were not enough, the boys also thought that their parents had scheduled a family photo shoot at Disney Springs, but upon their arrival they met a “tour guide” who explained about all the attractions there and about the beautiful Aerophile (Characters in Flight) Balloon. Just as he was explaining all the details of the balloon he asked the boys why they were there and when they said a photo shoot, he said “I think you are here for more than that. I think you are here to see your Mom and Dad get married.” The shock and thrill on the boy’s faces was spectacular when they looked at their parents and realized this was not a joke. Rev.Glynn Ferguson with Sensational Ceremonies was the “tour guide” that spoke to the boys and he was also the one to work with the couple to create a custom ceremony for the two of them. Their ceremony spoke of love, friendship, loyalty, fidelity, and trust. There was plenty of laughter, a few joyous tears, and a lot of great memories by all involved. Flowers by Lesley created the beautiful yellow bouquet and three matching boutonnieres that the family loved. The bride’s bouquet even had a jeweled hidden Mickey in one of the blooms. Edmund Rhodes from Rhodes Studios Photography and Videography provided both for the couple, so they could relive every moment of their fantastic day. Getting married 300 feet in the air is not something that everything does, but it fit this family perfectly!